Updating Barry Schwabsky’s 2012 label “retromodernism,” Colby Chamberlain coined the term “domestic modernism” to describe Margaret Lee’s recent installation of facsimiles depicting twentieth-century art and design icons. Noting that, “apparently Brancusi duplicates are trending,” Chamberlain compared Lee’s model of Brancusi’s “Endless Column” to another shown by Josephine Meckseper in 2013, highlighting their affinity in evoking department store displays. Now featured in the group show “MetaModern” at the Krannert Museum, William Cordova’s tribute to the Brancusi monument—a column of lampshades inverted in an alternating rhythm and lit from within—similarly evokes a retail aura. 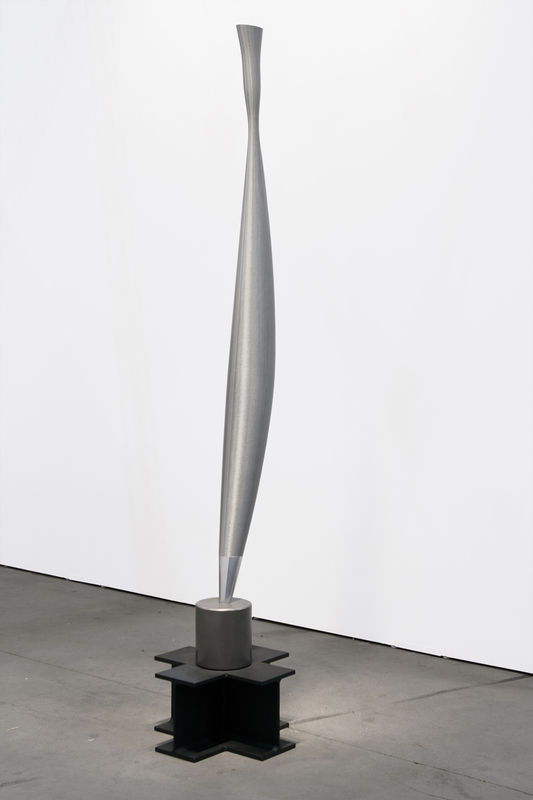 Iñigo Manglano-Ovalle also replicates a Brancusi phallus, but with a more aeronautical thrust; his nine-foot “Bird in Space” is fabricated from carbon fiber, Kevlar and steel, and seems ready to blow a Sputnik out of the sky. 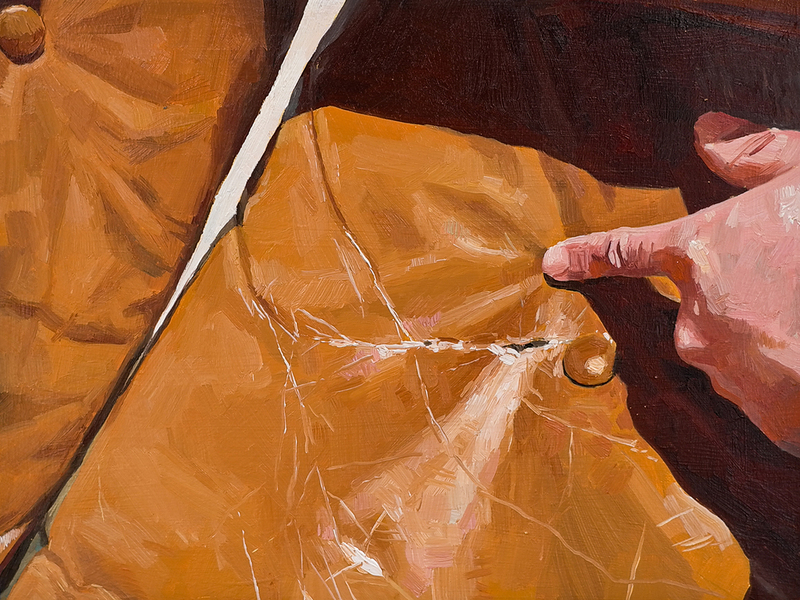 Resale, rather than retail, provides the context for Conrad Bakker’s series of small oil paintings depicting evidence of wear and damage to items listed as “mid-century modern” on eBay. This series included, fully one third of the twenty-seven pieces in “MetaModern” reference the work of Charles and Ray Eames, the twin demiurges of consumer-grade modernism—but non-Euro-American work is also represented. Jill Magid was denied access to the archives of Mexican architect Luis Barragán, but photographed a four-inch souvenir replica of Barragán’s “el butaque” chair and printed the image at the scale of a normal chair. 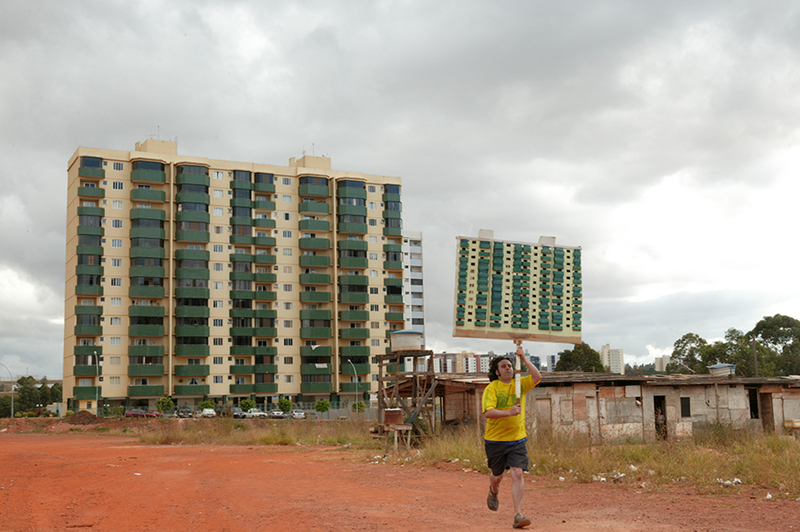 And in Jordi Colomer’s video slide show “Anarchitekton (Brasilia),” the artist Idroj Sanicne is shown running through residential areas of Brasilia, Bucharest, Barcelona and Osaka, bearing on a pole a roughly four-foot-tall cardboard model of a multi-story building, duplicated repeatedly in the skyline behind him. Through March 28 at the Krannert Art Museum, 500 East Peabody Drive, Champaign.